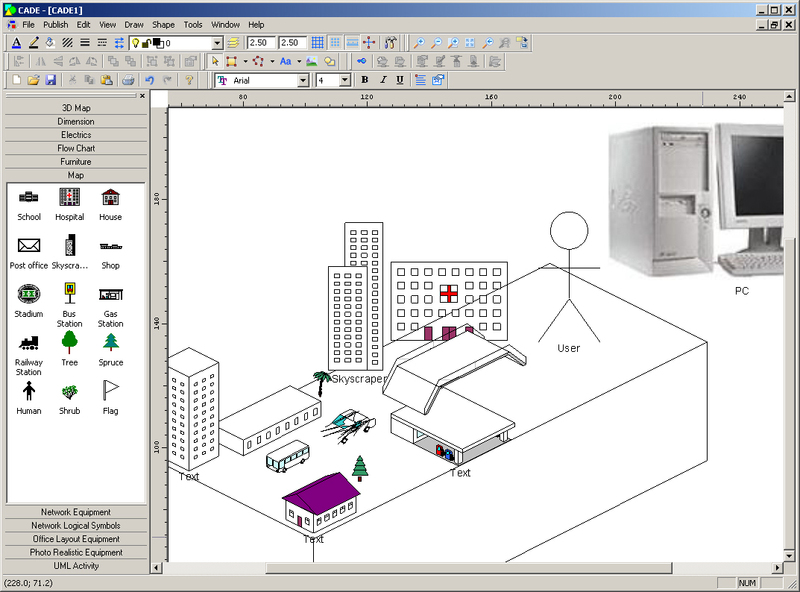 Like Dia, another company, WERESC, offers a free alternative to Microsoft Visio with their software CADE. Screenshot of CADE in action. Giant person in a city? CADE offers all of the typical template stamps to make network diagrams, flowcharts, database schemas, maps, and more. Two cool features that CADE offers over the competition: photo-realistic equipment and publishing to the web. The photo-realistic equipment is just template stamps of computer equipment, but it really helps the presentation be more readable. Publishing directly to the web is another free service offered with CADE. The second menu to the left is Publish. You can upload your files to the WERSC server and share them with collaborating partners without any web plug-ins.